Each time we complete a cycle on our journey of transformation, we get to reinvent ourselves and expand our dreams. We can aim higher, dream bigger, get our creative juices flowing and put our manifestation skills to good work. We do this by using our imaginations to visualize exactly what we desire, and then asking the Universe to assist us in co-creating it, well, that or something even better of course! Eagle represents freedom, liberty, power, strength and courage. She soars above the drama, unattached to outcomes yet with her eye always on her prey. She does not get knocked off course by fear of flying too high, and she knows that when she decides to go in for the kill she will do it with amazing skill and accuracy. 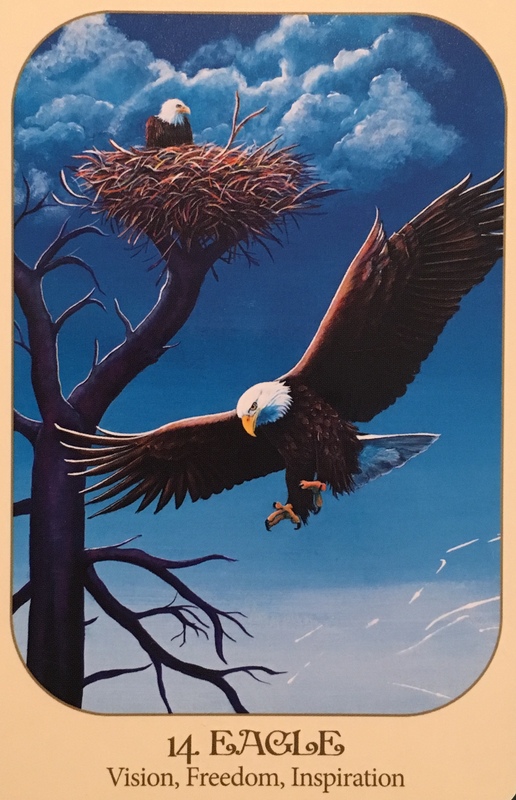 Eagle is here to remind us of the freedom we have available to us in every moment, that every choice, every action leads us either closer to or farther away from our dreams. She urges us not to get caught up in the thoughts, judgments or opinions of others, and to trust in our own instincts to lead us to exactly where we need to be. Trust in your own wings to take you where you need to go.